1. Rubix Cube~ I was one of those people who couldn't crack it. 4. Roller Skates, those that were adjustable to fit your feet with straps. 10. Gordon the Gopher... his squeeks got so annoying after a while. We had of course other things that were from the 80s but we didn't get them until the 90s. Those of you that were around in the 80s, What did you enjoy or remember of that time? Those of you that weren't what do you remember from the decade you were born? I love that I was born in the 80's :) Growing up, I had amazing toys. I feel sad for the kids today. All is so high tech. Ok, I also loved my Super NIntendo, but I also had these great board games, I always loved a simple memory games. I grew up with comodor, like you... Pac Man and some role play games later on. Etch-a-sketch!!! I also had a thing called spyrograph... that made these amazing geometrical shapes. <3 I can not find anything like that today anymore. I agree, I think we had great toys since we just missed the over the top computer fads, also school was much more simple unlike now where there are targets to be met, all has to involve computers its so.... sufforcating. Oh! 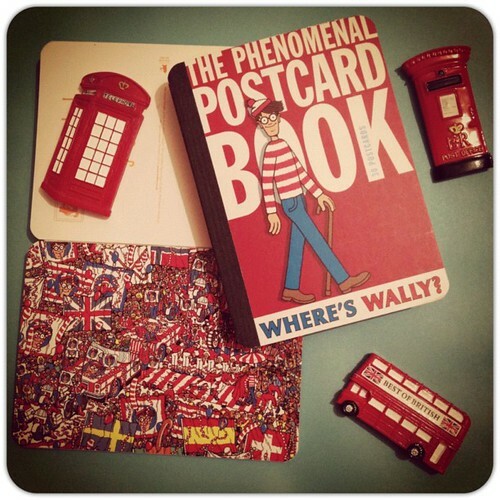 The mini book my niece has in a smaller version of the big Where's Wally Books but these are a lot more (nearly £4 a book), I thought to myself its 30p a postcard of a landscape so these work out way cheaper for 30 postcards which is why I bought 2 for nearly £8. If you'd still like one let me know. This one has the red cover and the other a blue one. I checked an online store here and I found the postcard books! They are... let me see... around 6,8 and 7 punds each. I just took the chance and got them as shipping was for free :) I just had to, so nice! These are the memories from my childhood and I do not know why, but at the moment I am clasping tightly onto them! I saw these and didn't even think twice about it so I know why you also felt the need to buy them, it is just associated with hours of finding him... the other thing that came to mind is those 3D images that we all could not help screwing our eyes up to see the image but I think those were a 90s fad. I rarely go into the birthday celebration for children at work but yesterday I was there for part of it and was a little gobsmacked at all the children wanted ipods, ipads, iphones and other such things that I didn't even know what they were. I have an iphone which went unclaimed after being left in my brother or Adeels car and Adeel was using it and gave it to me. I have a mobile phone so brick from the year I don't know what which is never switched on. I just think its sad that they have no imagination outside of technology. I also had to buy a magazine for teenagers in Germany which I used to read 15 years ago. What was cool back then is SO awful these days! A disappointment. oh your parachute pants reminded me of shell suits, ear muffs and bermuda shorts. We had such terrible fashion I think as I love childrens clothes now but in those days there was nothing nice to wear.